Three people accused of killing a 6-year-old boy in Mississippi were denied bail Monday as prosecutors consider whether to seek the death penalty against one of them. Madison County Justice Court Judge Bruce McKinley refused to give co-defendants Byron McBride Jr., Dwan Wakefield Jr. and D'Allen Washington a chance to get out of jail, saying he believed they were dangerous and might flee. The three are accused in the Thursday shooting death of Kingston Frazier. Frazier was asleep in the back of his mother's car when it was stolen from a supermarket parking lot in Jackson. The car was found abandoned in a muddy ditch hours later in suburban Gluckstadt, with Frazier's body in the back seat, shot multiple times. Court papers obtained by The Associated Press show Wakefield told investigators after his arrest Thursday that the 19-year-old McBride stole the car and shot Frazier. Family members of McBride and Wakefield asserted their innocence Monday to reporters after the hearing. Byron McBride Sr. criticized reporters for identifying his son as the person who shot the boy. "No weapon was found on my son," the father said. "How can you name my son? It's wrong. My son didn't kill that boy, but y'all are going to kill my son." District Attorney Michael Guest had said Friday that investigators were still looking for the gun used in the crime. Monday, he wouldn't say if the weapon had been found. Wakefield's aunt, Eva Roby, said the accusations don't fit her nephew's character. "I'd put my life on it that he's innocent," Roby said. "I know Dwan." Wakefield and Washington are ineligible for the death penalty because they are 17, but are being charged as adults and could face life in prison without parole. Both were high school students at the time of their arrest. Guest told reporters after the hearing that prosecutors haven't decided yet whether they will seek the death penalty against McBride, though he promised to "bring swift justice." "As the investigation concludes and we have a chance to look at everything, we will sit down with the family and make that decision," Guest said. Amos Archie, Frazier's great-uncle, declined to say whether Frazier's family wants Guest to seek the death penalty. 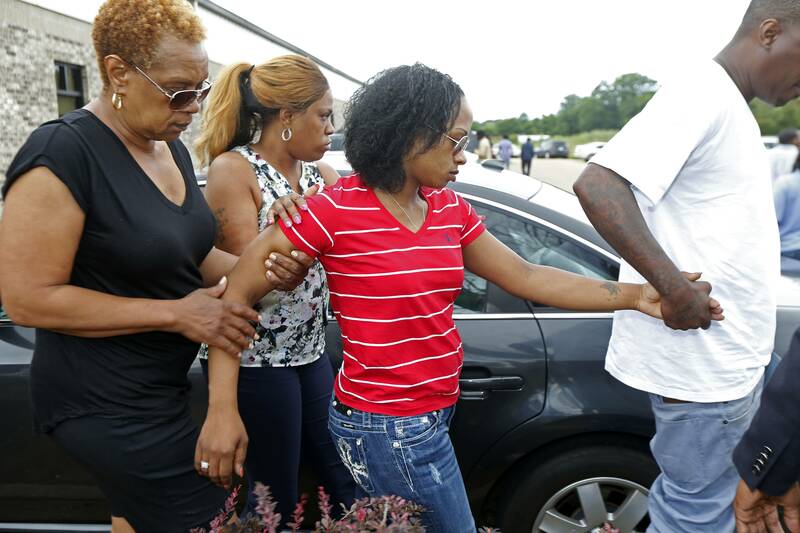 Frazier's mother, Ebony Archie, was present for the hearing but declined to speak to reporters. She was visibly shaking at points and was physically supported by family members as she walked out of the courtroom. "She's struggling," Amos Archie said. "She lost her son. It's painful. It's painful for her mother and father and it's painful for all our family. We believe in God. We believe justice is going to be done." The courtroom was filled with dozens of family members and friends of both the victim and the accused. The three defendants appeared by video from inside the neighboring county jail. Two were represented by a public defender, while one was represented by a private lawyer. County Prosecutor Pamela Hancock told McKinley that he should deny bail to all three. Washington was ineligible for bail because he's currently under indictment for armed robbery charges in a separate incident. "From what I've gathered, he is not only a flight risk but a special danger to others in the community," McKinley said in denying bail to Wakefield. He repeated similar reasons for denying bail to McBride. McBride told McKinley that he had previously been convicted of commercial burglary. Washington's lawyer, Warren Martin, questioned whether charges against his client should properly be filed in Madison County, since the car was stolen and boy kidnapped in neighboring Hinds County. Guest, though, says Madison County charges are proper because the boy's death happened there. Hinds County District Attorney Robert Shuler Smith, who attended Monday's hearing, said he intends to seek additional charges against the three defendants in his county. The judge set June 26 preliminary hearings for all three.